- Type : Fire tube vertical boiler. 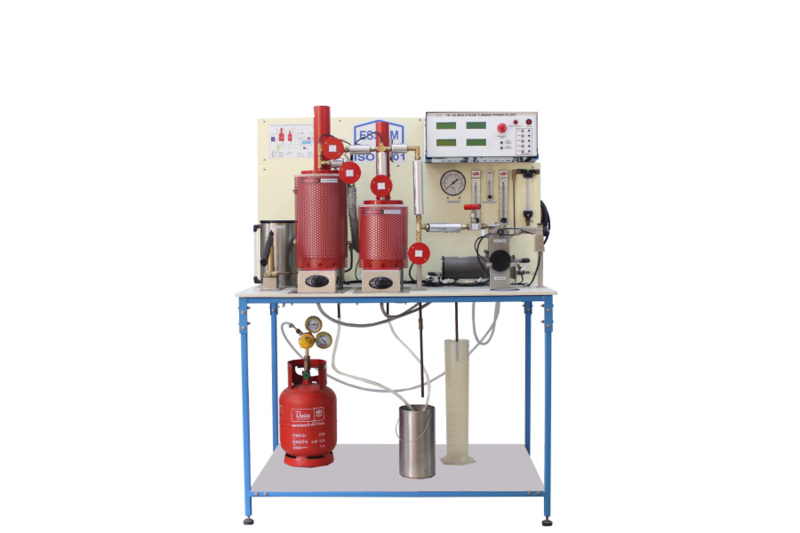 - Pressure : Upto 0.5 MPa gauge.
. Boiler accessories : Safety valve, level gauge.
. Fuel : Liquefied Petroleum Gas (LPG).
. Feed water tank : Stainless steel with level gauge.
. Feed pump : Hand operated. - Type : Single stage impulse turbine, single nozzle.
. Power output measurements : Mechanical brake dynamometer.
. Electrical power system : DC generator with lamp loads.
. Condenser : Shell and tube type. - Without super heater : Mechanical approx 12W. - With super heater (optional) : Mechanical approx 18W. - Pressures gauge : 1 ea. - Temperatures : 7 ea. - Flow meters : 2 ea. - Turbine speed and dynamometer torque : Digital display. - Graduated cylinder, and stop watch for condensate measurement. - Voltage and current digital display.
. Accessory : Boiler cleaning kits.